German rider Henry Jacobi of the F&H Kawasaki team put together a splendid 1-1 score yesterday in the opening round of the MX2 class at the Dutch Masters of Motocross. Up against the likes of Ben Watson, Jago Geerts, Adam Sterry and many leading GP riders Jacobi showed that his good form from the Grand Prix series is helping him with his confidence. We caught up with Jacobi this morning and asked about the weekend and also how he feels about his form in 2019. MXlarge: Firstly, congratulations on your win on the weekend. Can you explain to me how your weekend went? Jacobi: The times practice was a bit nervous for everyone, because many transponders didn’t work, and I did a few fast laps and then they didn’t show up. Later on, I was four quickest and I don’t know if they took my best lap or just one of my best laps, but I was fourth fastest and that was okay. Then the first start I had a good gate position, but then the gate didn’t drop, they didn’t drop at the same time, and I was last because my gate didn’t go all the way down. I saw the guy next to me go, and I was stuck. They restarted the race, and I got the holeshot. Geerts passed me in the second or third lap and I followed him and tried to apply some pressure. I tried to pass him, but I think I scared him, or shocked him a little bit, because he made a mistake and crashed. We didn’t make contact and I was a little behind him, but when he crashed, I had an easy lead over the others, like seven seconds or something. That was the first moto. Second race I was second in the start and I was behind Roan my team-mate, and it was like a training session for me and after 10 minutes I passed him and pulled a gap, maybe five seconds and then I saw Geerts was coming, and I tried to control it, but I had seven lappers and I lost a lot of time, but I secured the win. MXlarge: Obviously your results have improved a lot this year, compared to last year. I think last year you had like five top five finishes, and already this year after four rounds you have seven top five finishes in races. I know you have a new team, new trainer and many other changes, but what has been the big difference for you? Jacobi: I think 10% of everything. I don’t know where the biggest difference is. 10% of the bike, 10% of the trainer, 10% of the team, 10% the physical training. If I am sick, I have people who know what I need to take, otherwise I got to the doctor alone and am not sure what to take. There are so many things. MXlarge: I can imagine with the better results comes more pressure. Last year you finished top five and it was amazing, this year top five is where you probably feel you should be. So how do you deal with the pressure of that? Jacobi: I really don’t feel the pressure. I feel I can do every weekend 100% and I can do my best and that is all I can give. If I give it every weekend and if it is seventh place, or fifth place, that doesn’t matter, as long as I give 100%. MXLarge: I remember speaking to Marc (De Reuver) and he was telling me how he has to deal with each rider, and he said that with you he needs to tell you always to slow down, because you often push too hard. Is that true? Do you think more now rather than just winding the throttle open? Jacobi: Yes, that is really one of the things. We do so many motos together and I now know where I should pass riders, I still have enough oxygen in my brain to do this. Last year I just rode the race and see an opportunity and go for it, while this year, maybe I wait, or I let a guy pass and follow him. I am more able to think and that is a big improvement from last year. MXlarge: But that must also be because of your fitness, you mentioned about the oxygen in your brain? Jacobi: Yes, that is why, 100%. MXlarge: I spoke to Thomas (Olsen) at one round and he mentioned that you were too aggressive in racing. I am not a racer, so I can’t see that, but are you sometimes too aggressive when passing guys? Jacobi: No, I don’t think I am too aggressive. Aggressive is when you hurt somebody. If I see a possibility to pass, then I might go for it, but I don’t care what somebody says about that. This is motocross, it isn’t darts or fishing, or whatever. If I look back to the supercross days, they would be cleaning each other out and shaking hands after the race. I think Thomas was talking about in England when I crossed him a little bit, but I didn’t see him, and I don’t want to open that again, because I don’t care so much. MXLarge: You had really good results in England, is that your favourite GP until now? Jacobi: Yes, because I was able to win there. The first race I was chasing down Olsen to the finish and the second race I had a bad start, and two times fastest on the track. MXLarge: Obviously your confidence is very high at the moment. Jorge is on another level to everyone else; I think that is clear, but there are like 10 guys behind him. You have the young kids like Geerts and Vialle, coming through. Do you get excited racing those guys? Jacobi: I enjoy racing Geerts and Vialle. They are younger than me, but the same speed somethings and I have more experience. I feel more confidence racing these guys, while Prado is a better rider and against those guys, I feel I can beat them. MXLarge: This is your last year in MX2 and I know its early in the season, but I would guess you need something secures for MXGP before say August. Are you already getting interest for a rider in MXGP in 2020? Jacobi: I am making a name for myself right now, so some people see my good results. I want to concentrate on this year, because it is still a long season, and we still have good results possible. People are interested and are seeing my results. MXLarge: So, you feel confident for a rider in MXGP next year. Jacobi: Yes, I think so as I am riding now. It shouldn’t be a problem. 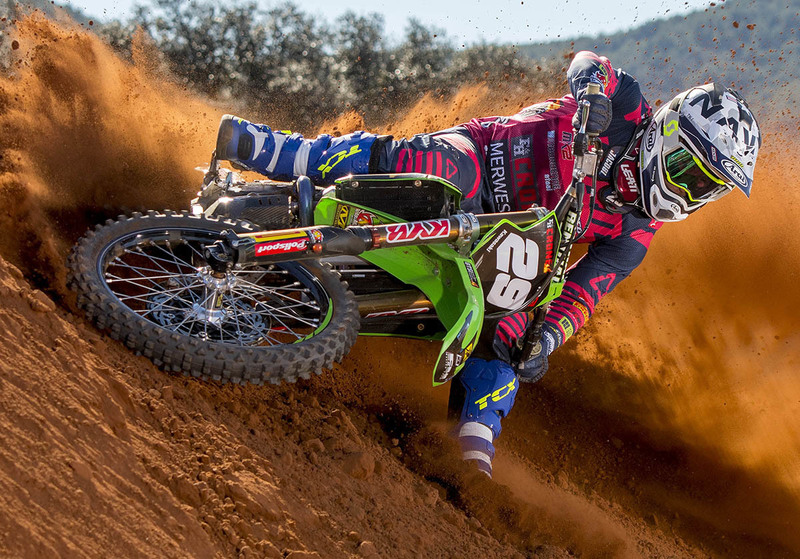 MXlarge: Obviously racing in the sand in Holland is great preparation for the next GP in Mantova. Jacobi: Yes, Axel (the next round of the Dutch championship) is very similar to Mantova. It is still the Dutch Masters and that is very important for the team. 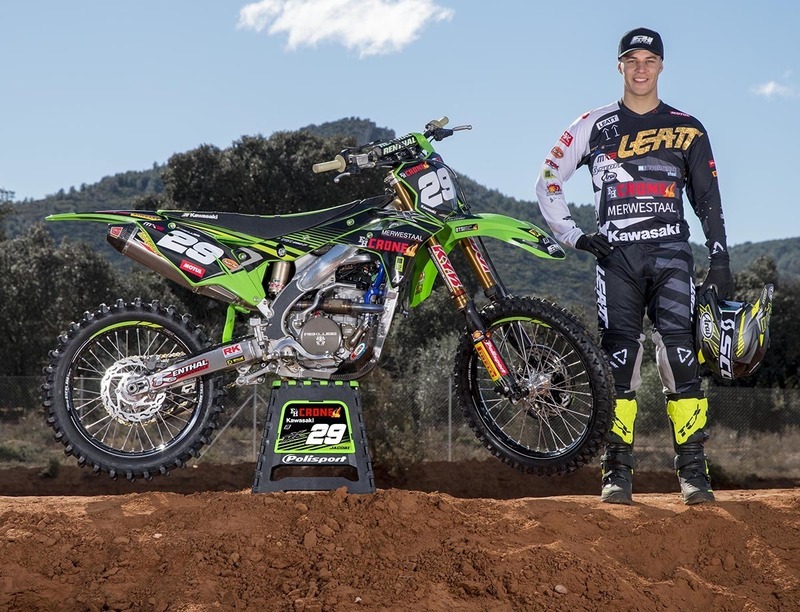 MXLarge: Obviously you want to be good in the GPs, but with Prado being a level above everyone else, I can imagine winning the MX2 class in the Dutch championship is very similar as far as importance goes? Jacobi: It is the same level for us. For me, there is also a lot of money winning the championships. We don’t get so much money in the GP, just some bonus or whatever. The Dutch Masters you get 1500euro for a moto win. A lot of mistakes from the other riders yesterday, so I have a good points lead and it is only four rounds and it is very important and a lot of fun.